CLASSIC Join a Guided Tour of Nuremberg’s medieval architecture, gilded fountain, gothic cathedral, and Kaiserburg Castle. Your river cruise will get underway as you sail through the Main Danube Canal with stops in some of Germany’s most intriguing cities. Also sail through the dramatic Rhine Gorge, considered the most beautiful stretch of the Rhine River. See ancient castles standing majestically on cliffs 400 feet above the water. In the heart of the Moselle region, the wine village of Bernkastel, surrounded by Germany’s largest expanse of vineyards, will fascinate you with its narrow streets and half-timbered houses which have been standing since the Middle Ages. Before you leave, we’ll introduce you to some of the famed wines of the area. Along the enchanting Moselle River, make your way to the ancient city of Trier, Germany—believed to be even older than Rome. Many remnants of ancient Rome can still be found, such as imperial baths and the Roman Bridge, with stone pilings dating from 144-152 AD. 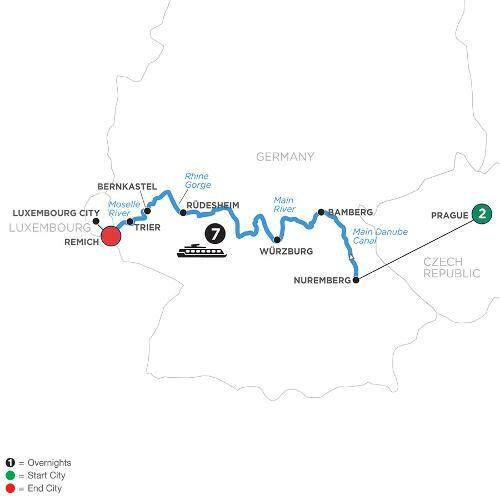 Your European river cruise through Central Europe comes to a close in the Luxembourg city of Remich. You’ll take many beautiful memories with you to recall this fantastic trip on the Main, Rhine, and Moselle Rivers.